The plot is about a young girl named Pink who is a bandit in the desert who steals water from the Silver Company. 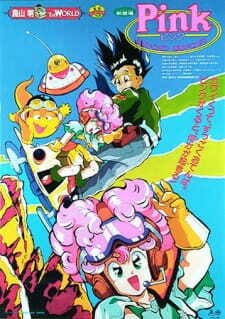 One of Akira Toriyama's lesser known works, this short movie was just epic and downright cute. Pink is a great character with highly relatable and grounded motivations that tie into the movie's plot seamlessly. Her intentions weren't to be a hero, but rather to look out for herself and her friends, and to get what she wants. In doing so, rather than a sense of justice being the catalyst of her good deeds, her personal goals and wants make her a hero, goals and wants which, by the way, are totally adorable! Her friends and the cop are fun characters, too. As for the plot, it's very simple. But there's nothing wrong with that. It's easy to follow and easy to relate to, and the stakes it brings to Pink's adventure will most of the time leave you by the edge of your seat, with exciting action and treacherous, yet wacky enemies. My only complaint would be regarding the animation itself, as it really holds back this movie from being great. Some of the important action and chase scenes suffer from awkward transitional cuts. Half the time you'd have difficulty figuring out where the characters are going or how they ended up from one place to another. The art looks nice and the backgrounds have good depth to them, but Toei Animation really needed a longer run-time for this movie, cause the rushed scenes left me dumbfounded. Other than that, this is recommend to anyone looking for a short, cute, fun action movie. Definitely a fulfilling 30 minutes of your time.